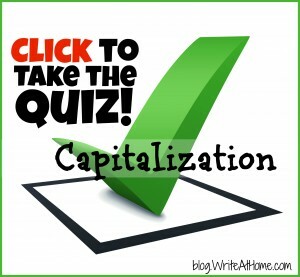 Home / Blog / Take the Capitalization Quiz! I posted an article on capitalization rules recently and thought a quiz might go over well. Feel free to brush up before you give it a try. Quizzes are free of course and just for fun. This one has ten questions, so it won’t take long. Good luck! Post your scores or any comments in the Reply section below! 90% I forgot to capitalize high school. I changed the answers on the Black Lagoon question to avoid conflict between the various style guides. There really isn’t one answer to the preposition question. Give yourself a perfect score, CJ! 80% — I forgot the rules on “president” and capitalizing prepositions (though “The Creature From the Black Lagoon” would be correct in AP style, with “From” capitalized).